As most of us know, traditional USB flash drives stick out from the back, and there is always a good chance you might actually knock it out accidentally. 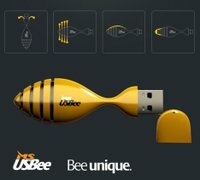 The USBee concept flash drive from Damjan Stankovic aims to avoid this problem, as it is capable of bending in any direction to prevent your USB port from being rendered useless for all eternity should a standard USB flash drive be broken off at its connector. In addition to being ergonomically designed, the USBee also has a vented housing for cooling and a detachable protective cap that snaps onto the back end of the device when not in use.